The numerical simulations were carried out for the following projects: The Iceberg Skating Palace, The Shayba Arena and The Bolshoy Ice Dome. The aim of the simulation was to analyze the air distribution solutions. Studies showed that the initial design solutions did not provide the necessary parameters of air temperature near the ice surface. The design requires appropriate adjustments. 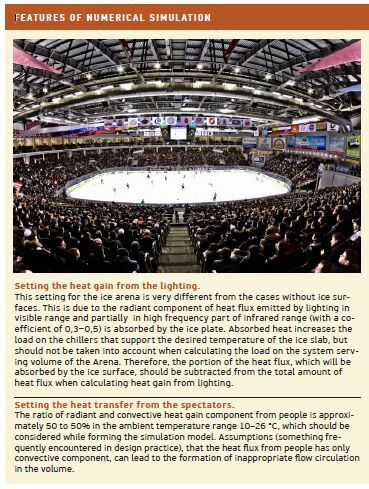 One of the major challenges in the ventilation design process is to keep different air parameters (temperature and humidity) near the ice surface and at the tribunes. Inability to ensure the air parameters in the vicinity of the ice surface will result in uneven ice melting and curvature of the surface, which are completely unacceptable for the Olympic venues. In addition, the parameters of the air immediately affect the emotional and physical wellbeing of the spectators and sportsmen. Important task in ice skating rinks design is to provide them with modern ventilation and air conditioning systems that maintained the parameters of the air in the arena volume. The range of these values must provide comfort and match technological conditions. necessity to consider radiant component of thermal flux at the most of surfaces involved in heat transfer (the ice surface and roof). These features result in the necessity of using the computational fluid dynamics methods for analysis and subsequent correction of design solutions for air distribution in ice arenas. That requires using the methods based on the numerical solution of differential three-dimensional Navier – Stokes equations. In the analysis of design solutions for Olympic venues The Shayba Arena and the The Bolshoy Ice Dome were simulated the mode of «hockey game» and for The Iceberg Skating Palace - the regime was «figure skating» and «short-track». Spectators are the cause of significant heat and vapor transfer into the arena area. In addition, the model takes into account heat gain from the lighting and information displays. Ice temperature varies with the type of event. Thus, for competition in figure skating ice temperature must be –4 ° C, for hockey game –5 ° C, and for short-track competitions –8 ° C.
Strict requirements are placed on the values of temperature and relative humidity at 1 m above the ice surface. The temperature in the spectator area should be maintained in the range of 18 to 24 °C. Movement of hockey players leads to intensive mixing of air mass in the vicinity of the ice surface. This leads to the destruction of the laminar boundary layer on the ice surface and thus increases the heat transfer coefficient of the ice surface. In combination with the intensive air mixing over ice surface this leads to air temperature decrease (compared with the case with motionless players) above ice. The mathematical model with the introduction sources of turbulent kinetic energy and its dissipation rate in the players’ area was created to simulate this effect. As studies have shown, the most challenging in the design is the organization of the air supply to the area of the ice surface. The main problem while choosing the equipment, for example, for the nozzles, is that engineers usually put the supply air temperature of the nozzle and the temperature in the working area, in this case near the ice field, as input parameters for the design software. However, in the case of ice arenas it turns out completely incorrect. So, if the supply air temperature at the nozzles is 20 °C, and the temperature at 1 m above the ice surface is 14 °C, then the design software (or by the laws of jet flows) considers supply jet as «warm», i.e. supernatant in the direction of the ice field, with a corresponding decreasing of jet length. However, due to considerable heat transfer from spectators (about 1 MW), which take place for large objects, particularly Olympic venues, the temperature in the upper zone rises above 25 °C. In this case, the supply air from the nozzle (20 °C) at the beginning spreads as «cold» in the ambient air with temperature above 25 °C, accelerating with respect to isothermal jet, and then as get closer to the ice surface begins to behave as a «warm» one and supernatants. Thus, the actual jet length significantly exceeds that value, which will the design software give. As a result, in practice, the jet will «bump» in the ice, bringing the warm air and causing the melting of the ice. It is the situation that was obtained during numerical simulation for the initial design of the The Iceberg Skating Palace. It is extremely difficult to predict the air temperature fields in order to take into account when formulating the design solutions and, for some cases, it is impossible without involving a numerical simulation model.